A dive into our exclusive collaborations and special partnerships. 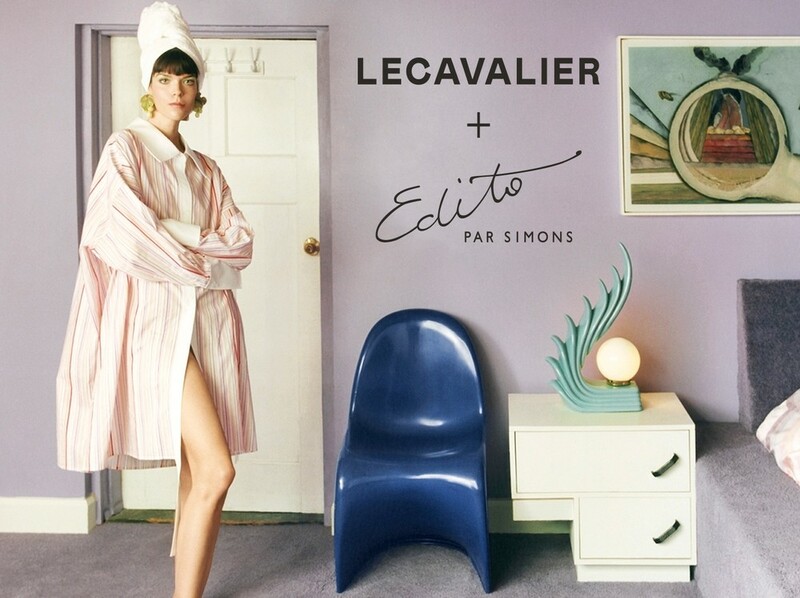 Montreal designer Marie-Ève Lecavalier joins forces with Édito to create the first-ever designer collection produced by Simons. The following tête-à-tête is written by Anja Aronowsky Cronberg who founded Vestoj in 2009 as a platform for critical thinking in fashion. Today, she runs the annual Vestoj Journal, Vestoj Online, and the live performance Vestoj Salons. She lives in Paris and produces Vestoj under the partial patronage of London College of Fashion, where she also works as a Senior Research Fellow in Fashion Theory and Practice. With her clothes hanging neatly in a beautiful and spacious Parisian showroom not far from the fashionable Marais, she receives me with a firm handshake and a warm smile. The week spent in the city has been stressful, I can tell. Since she won a prize at the Villa Noailles Festival d’Hyères, everybody wants a little piece of Marie-Ève. She’s nominated for the LVMH prize now – the prize that ensures that everybody’s eyes are on you in fashion – so it’s not surprising that both buyers and journalists are lining up. But considering that she’s still learning to navigate this business, what does she make of it all? Timing is so important in fashion, timing and luck. Being at the right place at the right time, and realising it. I got a ginormous push when I won the Chloé prize at the Festival d'Hyères in France. The founder, Jean-Pierre Blanc, was one of my teachers at HEAD in Switzerland so I'd heard a lot about the prize before I applied in fact. I figured that the handmade or crafted element of my work would resonate with them, and I was right. I wasn't prepared for all the attention I got though; I'm not sure anything can prepare you for that. I was so surprised that so many journalists were interested in what I had to say. In school, I didn't really feel understood so I wasn't used to the attention. And I had no brand yet, just my graduate collection. I was still interning! But somehow a lot of retailers thought I was already a full-fledged designer house, so it made me really think deeply about what my next step should be. Since I got so much press coverage, it made sense to produce the collection, but I was living far from home and had nothing set up to do it. I had no money – I didn't even have a bed. So I finished up my time in Belgium and returned to Montreal. I put all my savings into producing that first collection. In fashion, there are so many costs to consider: materials, equipment, your atelier. Then, you can spend even more on a showroom and press representation. But I quickly realized that there was just no way I’d be able to afford all that; as a young brand, you have to choose where to invest your resources. You have to learn to be your own sales and press agent. You just have to take on as many different roles as possible. That’s probably the hardest part of being a young designer: you have to do everything yourself. I’ve been lucky, though. A lot of people see promise in me and want to help. They helped me even though I can’t pay. I’ve learned to be resourceful, and to take advantage of the assets that are available for free – Instagram, for example, is so good for promoting your work. I’d tell any young designer to be thrifty wherever you can, and save as much as possible for production – there are so many surprises in this process, and it can easily eat up your whole budget. I grew up in the suburbs of Montreal in a working-class family. My parents are artists but they decided to go for stability when it came to their working life; my mom was a secretary and my father a music teacher. Maybe that attitude is a generational thing because I always knew I was willing to take the risk when it came to my education and profession. Fashion is an elitist industry and it attracts a lot of people with money. Education isn't fair in this sense and sometimes, I couldn't help but compare myself to some of my classmates that came from wealthy backgrounds. Things are so much easier in fashion if you have money. But I'm stubborn. I worked three jobs at one point, I didn't go out, I never took vacation, and I bought nothing. In many ways, I'm the black sheep of the family. It took a while for my parents and my brother to understand why I was torturing myself at school and why I still work so hard. I mean I'm thirty and still struggling. I know that if they could help me they would, but they can't. Every school has their star student, and I was never it. When I finished my bachelor's degree in Montreal, I started applying for jobs in high fashion in Europe and in New York. I applied at Raf Simons and they told me that my portfolio wasn't strong enough. That gave me pause. I thought if my portfolio isn't strong enough, I need to figure out how to make it stronger. In Canada we have a really solid education when it comes to the technical side but we lack creative vision and risk-taking. When I went to Europe to study, this was what I wanted to focus on. I knew my technical skills were good but I wanted to find my voice aesthetically. As a BA student, I was always comparing my work to others. I was so insecure. As an MA student, my job was to find my own voice, and eventually I did. When I graduated from my master’s degree, I applied again at Raf Simons, and this time they took me on. I realized that there is so much competition in fashion right now so if you want to stand out, you have to go personal. I'm learning to listen to my gut. In this way, I think being in Montreal is really helpful. I can stay in my bubble. While I was still at school my idea of the industry was quite naïve. I thought that every season, designers started with a blank page and produced everything from scratch. While interning, I understood that it's a business, which means you have to go fast. You learn how to make a creative idea practically possible, and you have to make peace with the restraints and compromises that come along with that. The best advice I got was, “Don't be too hard on yourself”. I might feel insecure or as if I'm doing badly, but I'm still learning. I don't need to have it all figured out – it's a process. I’m really cautious in everything I do and I’m very protective of my work. I was nothing before I won the prize at Villa Noailles, and now I have so many people watching me. People offer me advice all the time, and my job is to filter it all. I often think of what one of my teachers told me: listen to everybody, but remember that you don’t have to take the advice. Think about what applies to you, and the rest, well you brush it off. I have a good instinct about people, about who to let in and who to disregard. I look for people who are calm and professional – I’d rather have that than the latest cool kid, if you know what I mean. I’m taking it slow and allowing things to grow organically and I’m really satisfied with the people that surround me. I can trust them and I know they want the best for me. There are no paid jobs in fashion. Most people who graduate face at least one year of unpaid internships. That wasn’t an option for me. I figured I could either be unemployed or start my own company so I chose the latter. I’d rather struggle but know that I’m building something of my own. It’s funny, I have so many friends that started businesses in the last couple of years, all for the same reason. The fashion industry is run on unpaid internships now. I think internships should be paid, of course, but as a small business owner I also rely on them. It’s complicated. How do I keep on going? Well, everybody knows that you don’t make money in the first year so just staying afloat is the most important and most difficult. When you’re a student, you’re on your own, you know? You’re not responsible for anyone. If you don’t eat or sleep, it’s your own health that you’re gambling with. When you’re a professional, you’re dealing with other people’s lives and livelihoods. The hardest thing is letting people down. Five months ago, I was still a baby in this business. I’ve learned and grown so much in that time. I’m freelancing for some very high-end fashion houses in Paris now, and I’ve collaborated with interesting partners. This collection for Simons is a good example. I’m realizing my value, which is very important. You have to know it and own it. You have to protect it. I’m understanding the leverage I have, and learning how to politely say no when I need to. I have worked so hard, and I want to associate with people who understand my point of view, and can support it. That, to me, is success – just doing what I love every day. Catherine Lavoie sees art in her soup, in her cereal, and in her ramen as well. Her daily life is an endless source of inspiration. This spring, she shares her overflowing creativity with us in an exclusive collection of T-shirts featuring pretty, colourful, and minimalist prints that suit her to a T! Let yourself be won over just like we were by this artist and her artwork. This spring, the team wanted to doubly invest itself in its newest project by creating a clothing collection made from eco-friendly materials that we called Team Green. When you buy one of these garments made of certified lyocell and organic cotton, $5 will be donated to the Cultiver l'Espoir program. “We are so small between the stars, so large against the sky,” wrote Leonard Cohen, whose significant prose gave birth to this year's ninth edition of the Manif d'art de Québec, orchestrated by the director of the Ikon Gallery of Birmingham, Jonathan Watkins. It's with immense pleasure that influencer Despina Daniilids wrote this article in which she tells us about her adventure in Seoul and her love for Too Cool For School's Korean skincare products that are now available at Simons. A few months ago, Simons announced that it would be acquiring Rituels, a company from Quebec City that specializes in shaving accessories and other grooming products for men. Alysa is the director of conservation outreach and a staff scientist at Polar Bears International (PBI), an organization dedicated to conserving polar bears and the sea ice they depend on for survival. Handcrafted in the city of St-Tite, cowboy boots made by the Canadian company Boulet Inc. are crossing new frontiers and stepping out overseas. At Simons, art is important to us. We're inspired by the work of artists, since like them, we believe that art beautifies the world and helps new ideas to emerge. That's why, season after season, we love collaborating with creators and designers from all over the world. Simons is proud to be hosting our very first urban hives at our Old Quebec, Carrefour Laval, and Square One stores in collaboration with the Canadian company, Alvéole. With her MARIPIER x blush lingerie collection launching exclusively this month at Simons, and Face au Mur a new game show series based on LeBron James' The Wall coming this winter – bewitching, mercurial and utterly charming Quebec TV It Girl Maripier Morin is sitting pretty at the top of her game, naturally. When it comes to making leather goods, it's hard to beat Italian expertise. For family-run company Fracap, every single shoe that's made is treated like a work of art. Simons is proud to collaborate with the Cappellos in offering high-quality, fashionable boots for men. Staying in one of the hotels by Group Germain Hotels is almost like being hosted by a member of your family! From coast to coast, they go above and beyond so that each guest feels unique, special, and pampered. If Canadians are known for being warm and welcoming, then the Germains embody this to a T! When they met just over 2 years ago, their connection was immediate and mutual. The same vision of fashion and aesthetics —it's no surprise that actress Karine Vanasse and designer Elisa C-Rossow wanted to collaborate on a unique and exclusive collection at Simons. There's no fashion like British street-fashion. From Katharine Hamnett to Jeremy Scott, its edge, its style and its attitude inspire cult-like followings. And thanks to George and Mike Heaton, the brothers behind Represent, the buzz is coming from the north of England this time. We talked to George about what makes Manchester-based Represent such a stand-up standout, and learned how family is their driving force. A Collaborative Collection of Eco-friendly Leggings Exclusively at Simons. Elles sont deux jeunes mamans et sont toutes deux amoureuses du yoga, de la méditation et de la nature. Elles étaient à la recherche d'un legging en accord parfait avec leur mode de vie actif. Et faute de trouver le legging sans défaut, elles l'ont créé. Depuis 2016, Madeleine Arcand et Maxime Morin sont les deux femmes à la tête de Rose Buddha, une entreprise québécoise de leggings haut de gamme qui plaisent autant pour le look qu'ils procurent que pour leur conception 100 % écoresponsable. Fashion and art often go hand in hand, and this collaboration is no exception. June Swimwear x Jason Cantoro is the work of two Canadian creators who combined their expertise to produce a swimwear collection that's available exclusively at Simons. Making our way down one of Quebec City's main roads, we head towards the home of the young Quebec illustrator, Esthera Preda. She's graciously invited us over. She's a fabulous New York fashionista with a sassy attitude, a soft spot for kale, and an obsession with everything hanging in Anna Dello Russo's closet. Never was there a caricature with “sew” much character as Sew Sketchy, the illustrious illustration that fashion fans just can't get enough of. Calgary artist Maya Gohill has a knack for charming everyone she meets. From her delightful personality to her impeccable sense of fashion, everything about the 40-something-year-old is as bright and expansive as the three storey-high mural she created for her hometown Simons' flagship. Find out about a few of our 2016 initiatives that made a difference alongside local organizations. A gift that will have everyone talking! This famous Quebec fashion designer has created a brand new collaboration that's exclusively available at Simons! Simons is proud to present the newest fashion show on Vrak. Estelle & Lucille is a new type of knitwear company that supports society's grandmothers, their know-how, and the quality of handmade knit products. Who better to talk about her new collection than the designer herself? Samantha Pynn was willing to become our blog writer for the day! He was a renowned painter, an experienced graphic artist and a beloved teacher. He also left La Maison Simons with a cherished legacy: its iconic green leaf! A great sailboat built in 1928 is currently cruising across the Atlantic. On board, expertise and tradition are making the long journey from France to Quebec. Destination: Simons. Dressing the world one pocket tee at a time! Poches & Fils is an up-and-coming Montreal company that makes pocket tees and tops. Its business concept is simple: customers choose the kind of top they want, then personalize it with a pocket they'd like to show off. Samantha Pynn is a pillar in the Canadian interior design landscape. Simons has been at the forefront of fashion since 1840 and considers art among its chief priorities. Its choice of collections by international designers, the clothing design process and even the design of Simons stores consistently demonstrate that art with a capital A is of central importance.